Why Is LAPD Going to Patrol City Buses and Trains When There Aren’t Enough Officers Patrolling the L.A. Streets? Two days ago, the Los Angeles City Council’s Public Safety Committee pressed the Los Angeles Police Department for detailed explanations of how officers are deployed across city streets, amid concerns that there aren’t enough cops working patrol duty to adequately respond to calls for help. As if to mock that concern and add insult to injury, the Los Angeles County Metropolitan Transportation Authority board of directors announced Thursday that the LAPD will begin patrolling trains and buses as part of a new multiagency approach to transit security beginning July 1, CBS News reports. How the LAPD uses its roughly 9,900 officers has drawn fresh attention from City Hall in recent months, with the union representing rank-and-file cops leading the charge. Union officials have accused LAPD brass of pulling too many officers from patrol duties for specialized units, such as the recently formed Community Relationship Division and much-publicized Metropolitan Division, an elite unit that was doubled in size in 2015 to help suppress the citywide crime surge. As a result, the police union has said, patrol officers are forced to rush from call to call, slowing response times, preventing police from building connections with residents and hurting officer morale. Currently, the Los Angeles Sheriff’s Department patrols the city transit system and has had jurisdiction over it for the last five years. Metro staff say the change would put more law-enforcement personnel in buses and trains and result in faster response times. While the safety of Metro passengers and employees is important and should be a priority, the safety of the citizens of the city in which Metro operates is of utmost importance, too. Crime in Los Angeles continued to rise last year, and residents and officers alike have complained about slow response times and low police presence in some neighborhoods. Those supporting the call for more patrol officers have pointed to a figure from 1969, which was cited in the motion introduced by Bonin and Buscaino. On an average day in 1969, they said, 337 cops patrolled the city in about 180 cars. By comparison, during one afternoon in December 2016, 311 officers patrolled the city in fewer than 160 cars, according to the motion. 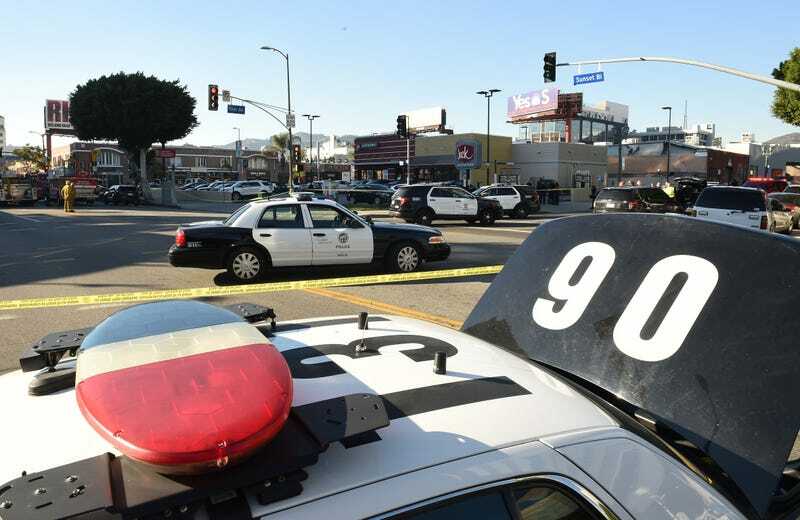 LAPD Assistant Chief Michel Moore cautioned council members that the department’s current deployment strategy reflected the “added complexity” of law enforcement in 2017. Today, he said, specialized units—those that address domestic violence, gang crime, mental illness and homelessness, for example—“augment and support” the cops working patrol duties. But can that LAPD be spared to supervise passengers on city trains and buses? LAPD’s contract with Metro specifies that it will patrol Metro areas within the city of Los Angeles. More than 60 percent of Metro’s buses and 5o percent of its rail lines operate within L.A. boundaries. Granted, that’s a combination of the LAPD, LASD and Long Beach Police Department, but what about the city of Los Angeles? The deal is at least lucrative for the LAPD, which will receive $369.3 million, while the LASD will receive $246.3 million and the Long Beach PD will receive $30.1 million. That’s a lot of money to hand out fare-evasion citations. Speaking of fare-evasion citations, it’s worth noting that according to a civil rights complaint filed by the Labor/Community Strategy Center, from 2012 to 2015, although black riders make up only 19 percent of Metro riders, they received more than 5o percent of all fare-evasion citations and made up 60 percent of all arrests on Metro. The U.S. Department of Transportation announced in January that it was investigating the complaint. This wouldn’t be a system at play, would it? Why stop crime or even prevent it when you can have an instant feeder system into the prison pipeline? Fare-evasion citations are a fast and easy way to introduce everyone, young and old, into a criminal-justice system that announced Thursday it would continue to use the private prison industry. But let’s keep pretending that these things are not related. It helps us sleep better at night. Read more at CBS News and the Los Angeles Times.